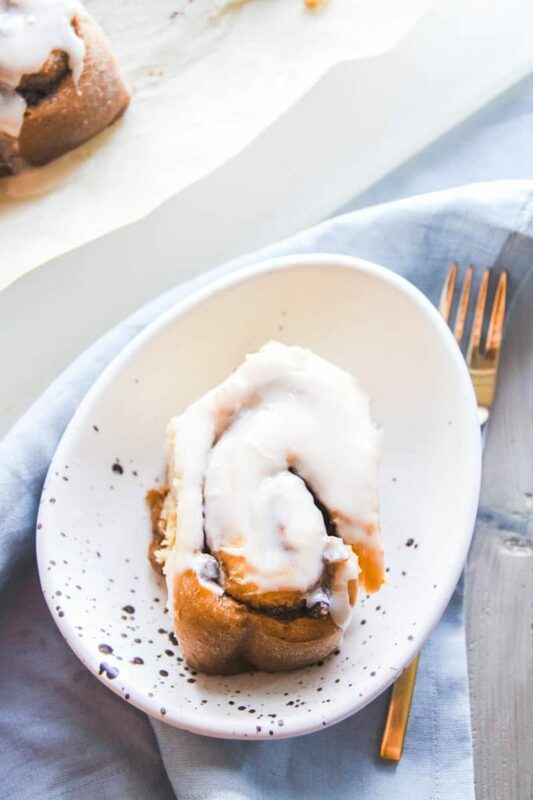 These slow cooker hot cross bun cinnamon rolls are perfect for a super delicious, no fuss, set-it-and-forget it Easter brunch recipe. 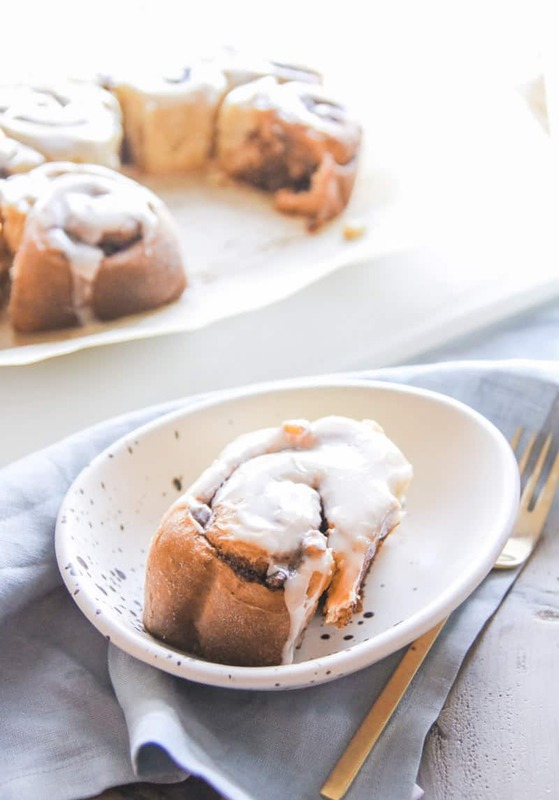 The most amazing thing about these incredible slow cooker hot cross bun cinnamon rolls is that the dough is super easy to make and there is no long rising time, because the slow heat from your slow cooker (and the almighty Red Star yeast) does all the work for you! So quick question here – did you know that Easter is in March this year? As in, Easter is less than two weeks away?! Um yeah, I had to do a double take when I saw that on my March calendar. The holiday completely snuck up on me. As soon as I realized that the holiday was fast approaching, I thought back to last year when I made this awesome cinnamon sugar pecan challah bread. However, as I said last year, patience is a virtue I don’t whole-heartedly embrace when it comes to bread making. I just want to whip up a dough and go, so to speak. I don’t want wait around for it to rise, I just don’t have time for that. Still wanting to make something that reminded me of the Easter bread season (for some reason Easter is always synonymous with bread and baking for me) I decided to try something out. I wanted to see if I could come up with a bread type recipe, something that uses Red Star yeast (their yeasts make the most incredible bread, it’s the only brand of yeast my family and I use) but that wouldn’t require a lot of hands on time. And that’s when it came to me – I should use my slow cooker to make something for Easter brunch. You see, that way, it would cook away while I was getting brunch ready and guests arrive, and then by the time it would be ready, everything else would be ready too (plus, it frees up precious oven space!) I also wanted to mix traditional flavors of hot cross buns with cinnamon rolls, so I added raisins and tweaked the dough of traditional cinnamon rolls a little. With minimal prep and hands-on time (I shared a step-by-step photo above) the end result is spectacular – hot crossed bun cinnamon rolls. They’re soft and sweet and everything you want for Easter brunch! There you have it – an easy peasy bread recipe (<– yup, it was easy enough for even me, the one who normally doesn’t have the patience to wait around for bread baking). 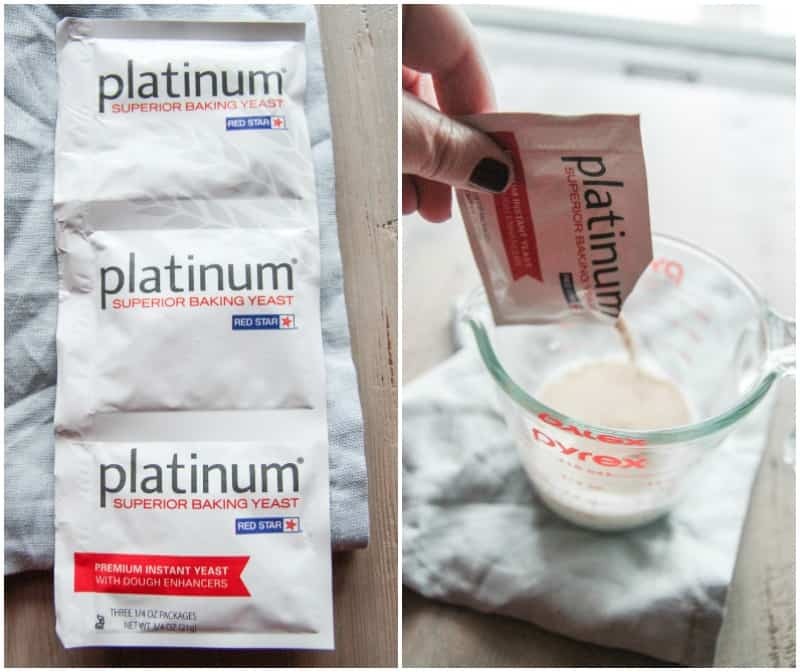 I also have to say, that like always, Red Star yeast worked wonders – I especially love their Platinum Instant Yeast which I used in this recipe (I also tested it with regular Red Star Yeast and it worked great too). So you know that I’ll be making these for Easter brunch, I’d love to know, what are your plans for Easter? 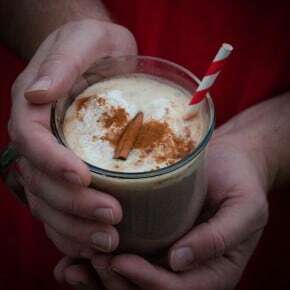 Start by warming the milk (I simply heat mine in the microwave for 1 minute, you don’t want it hotter than 95 degrees). 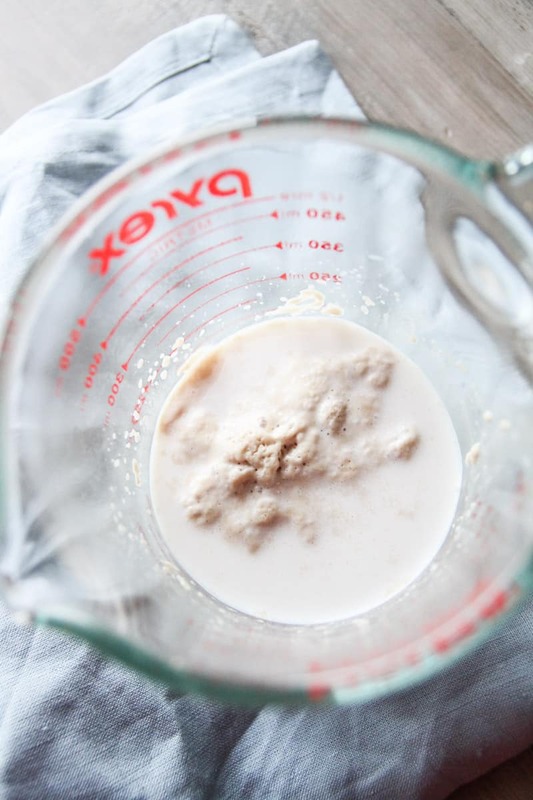 Add packet of yeast to the milk, stir once or twice and then let sit for 5-10 minutes until it is foamy. Pour milk and yeast mixture into a large mixing bowl and add in the sugar and egg and stir with a wooden spoon until combined. Next add in the melted butter and stir, and then add in the flour, baking powder and baking soda. Stir until the dough comes together. It will be a slightly wet and sticky dough. Form dough into a ball and put it on a floured board or surface. Make the filling while you let the dough ball hang out on the floured surface. To make the filling simply mix all the ingredients together and stir until combined. Now roll the dough out into a rectangle shape (mine is usually 12-14 inches long by 8 inches wide). 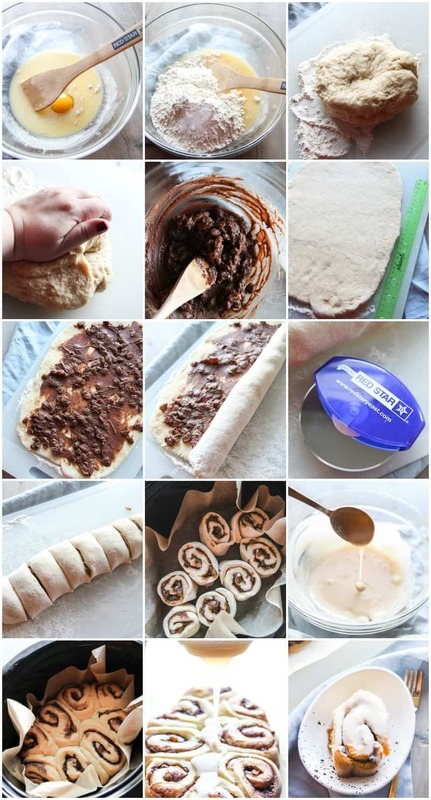 Spread the filling onto the dough with a spatula, and then carefully-yet-tightly- roll the dough along the long side. Line your slow cooker with parchment paper and spray it with cooking spray. Gently place formed hot cross bun cinnamon rolls in the bottom of your slow cooker, leaving a little space in between them. Place a layer of paper towels under the lid (important step, you don’t want the condensation dripping onto your dough) and cover the slow cooker. Turn on high and cook for 2 hours. When the hot cross bun cinnamon rolls are done (they will be slightly brown around the edges) carefully remove the parchment paper from the slow cooker and set them on a board. 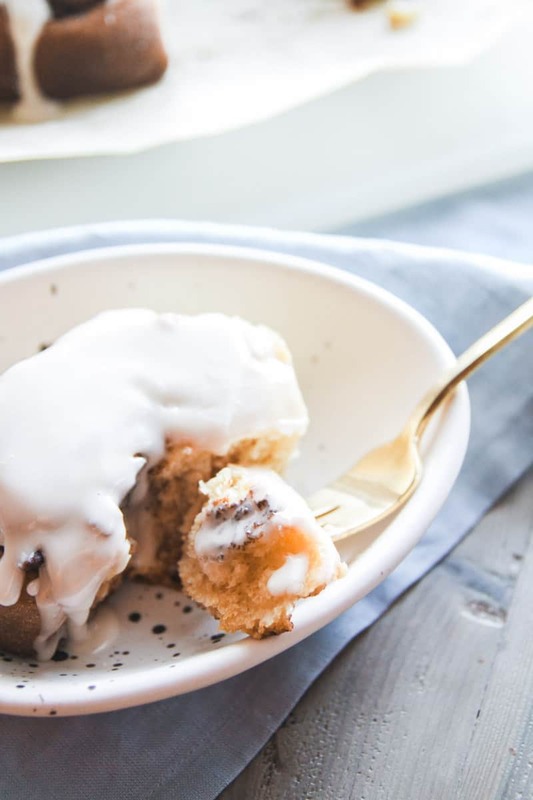 Make the frosting by stirring all the ingredients in a bowl, and then pour it over the hot cross bun cinnamon rolls. 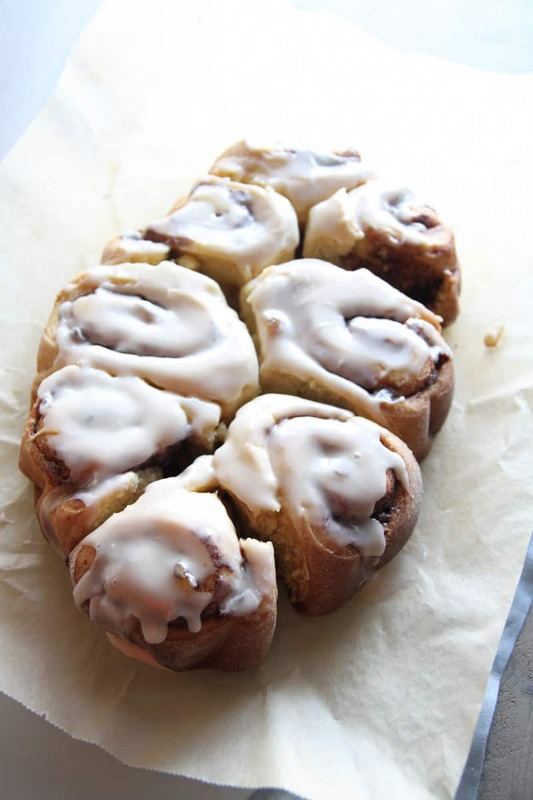 Gently break the cinnamon rolls apart and serve warm! I melt the butter in the microwave and set aside before starting to make the dough. I use a bowl and wooden spoon, but you could also use a stand mixer with a dough attachment to make the dough. Looking for more bread recipe inspiration? Check out Red Star Yeast on facebook, pinterest, twitter and instagram. 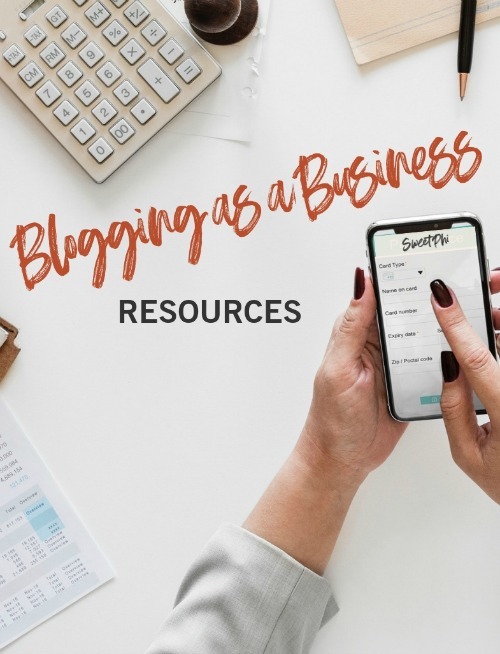 This deliciousness is brought to you by Red Star Yeast, all opinions are as always my own, thank you for supporting the brands and products I love and that make the Sweetphi blog possible. Hot cross buns and cinnamon rolls? And done in a slow cooker? You are a genius! I haven’t had a hot cross bun yet this year, but I can’t wait. Thank you for the amazing idea dear! hey girl these look oh so yummy! Happy Easter! 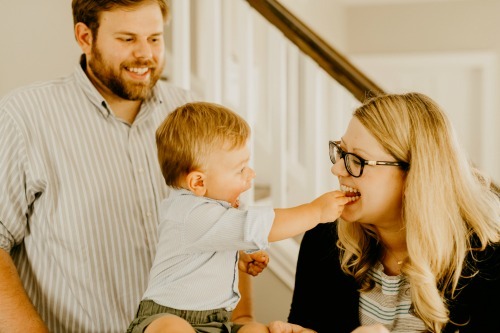 My husband and I will be going to church and I ‘m not sure what else we’ll be doing! These look perfect! 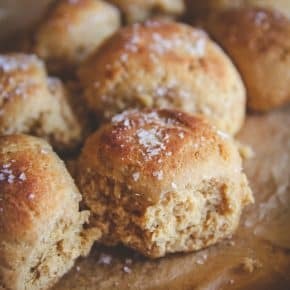 Love your technique in the slow cooker 🙂 I have to confess I’ve never made hot crossed buns or cinnamon rolls… maybe this will be my first foray! 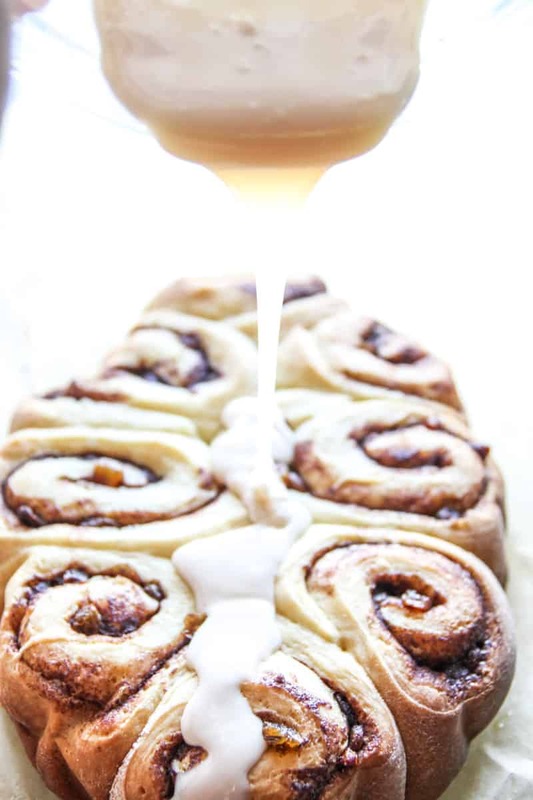 Wait…hold the phone…you’ve never made hot crossed buns or cinnamon rolls ?!? Girl, you MUST try them, homemade is so incredible! 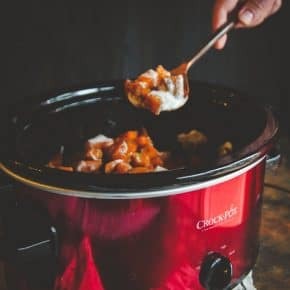 And this method of the slow cooker is totally the way to go because it doesn’t involve any crazy long rise time or kneading, it’s super easy and the end result is amazing! Do you think the dough (with filling) can be refrigerated or froze before putting in the slow cooker? I would love to make these for a camping breakfast but would want to prep them before we leave and make them Sunday a.m Thanks! Yes, that would work well i think! I’d love to know how it turns out for you.